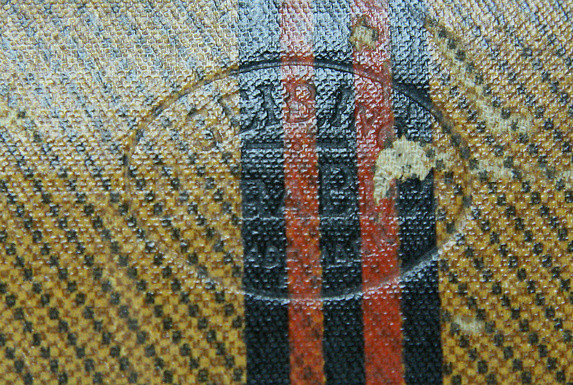 Tweed airline stripe case made by Geib from the mid 30ties until the early 40ties. 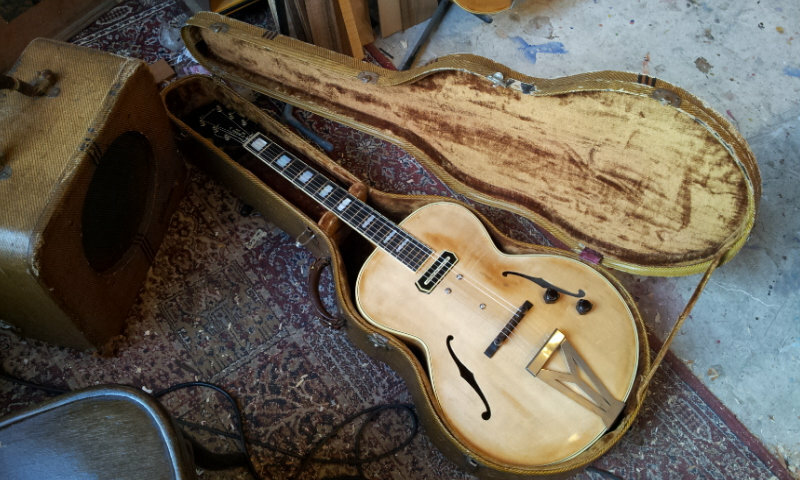 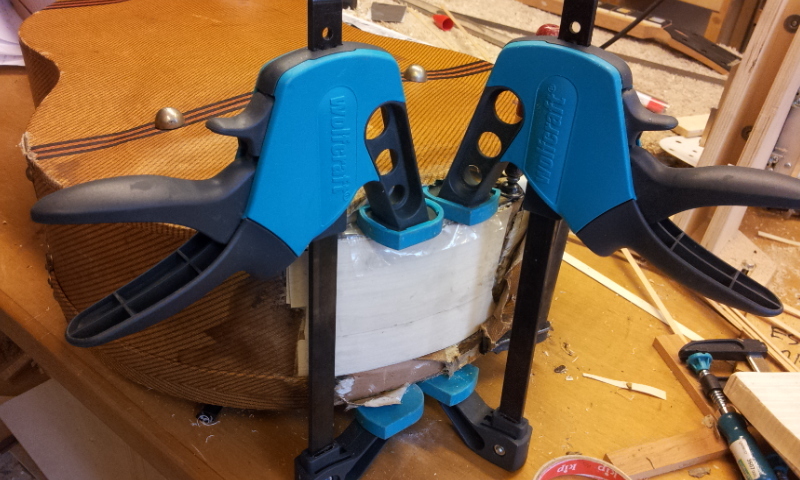 There are cases made for the 16 inch ánd 17 inch archtop jazz guitar. 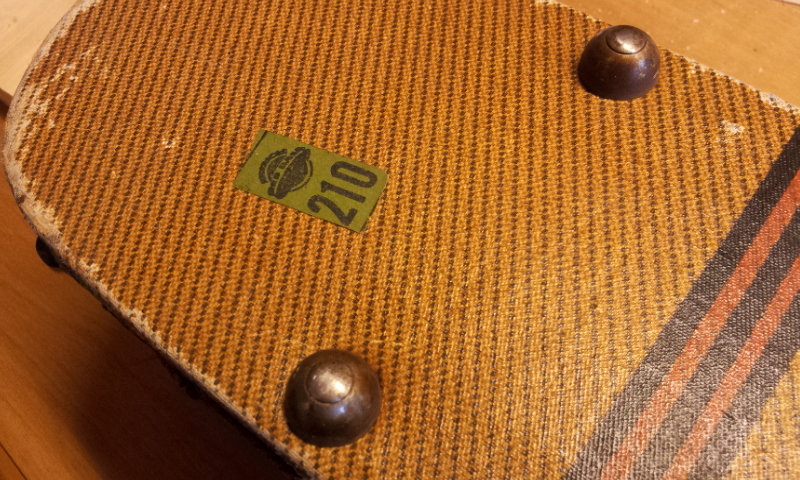 Great looks, these are objects of beauty, charm and functionality. 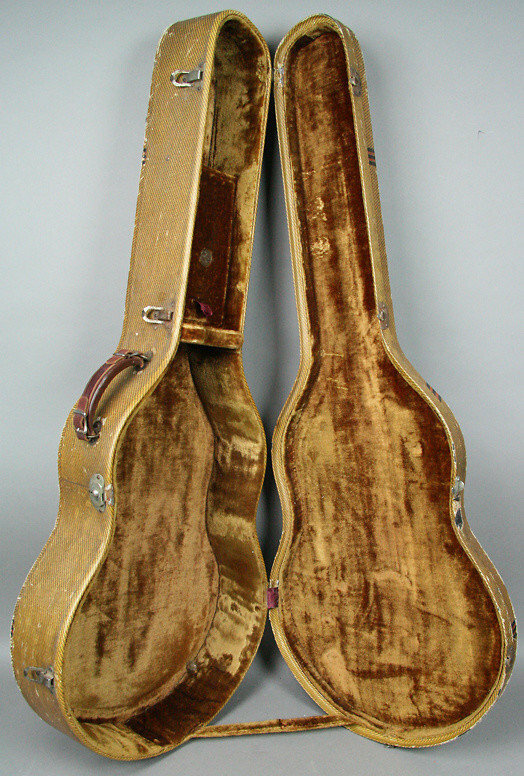 In Daniel's opinion the most beautiful guitar case ever made. 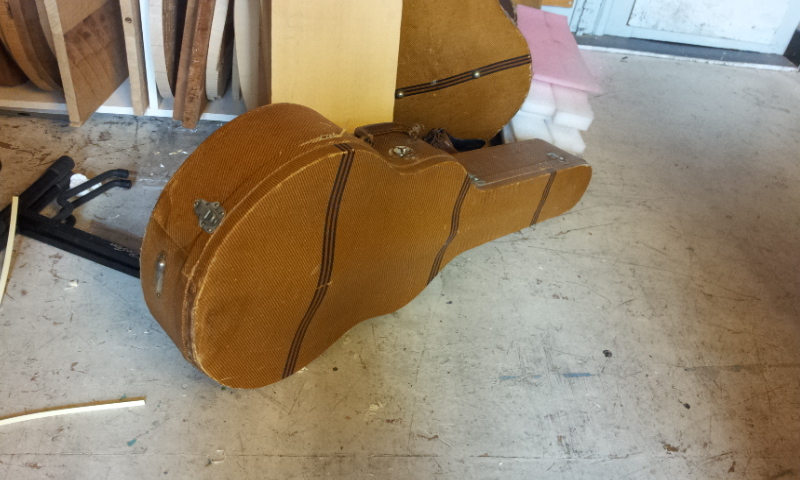 At the moment two 16 inch cases are available. 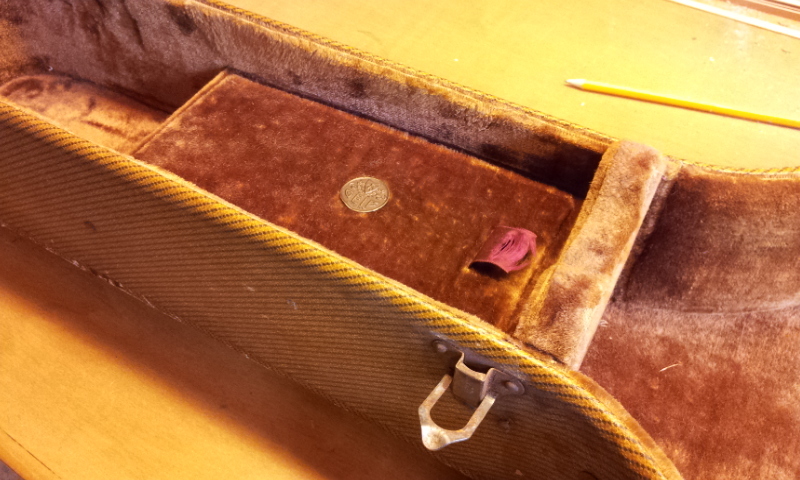 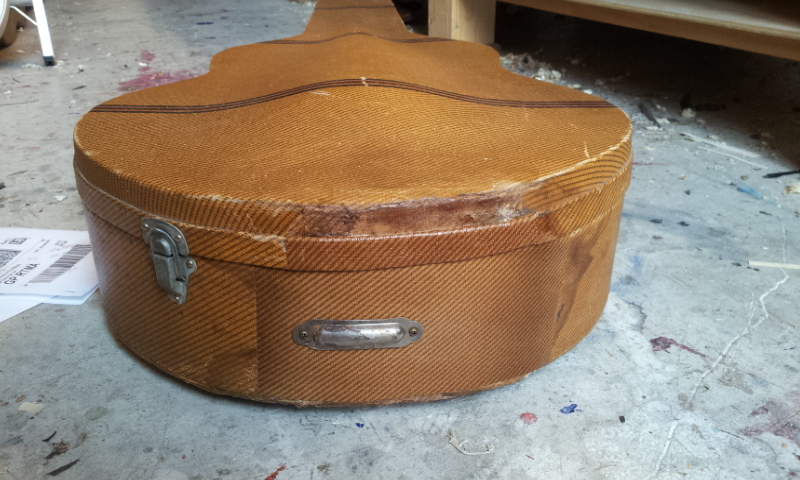 Case 1; for 16 inch guitar, pristine condition, champagne plush lined interior, Geib badge in place. 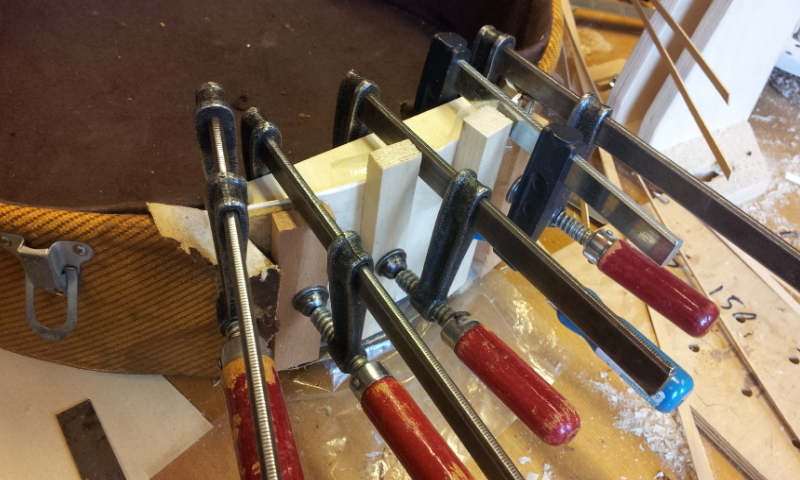 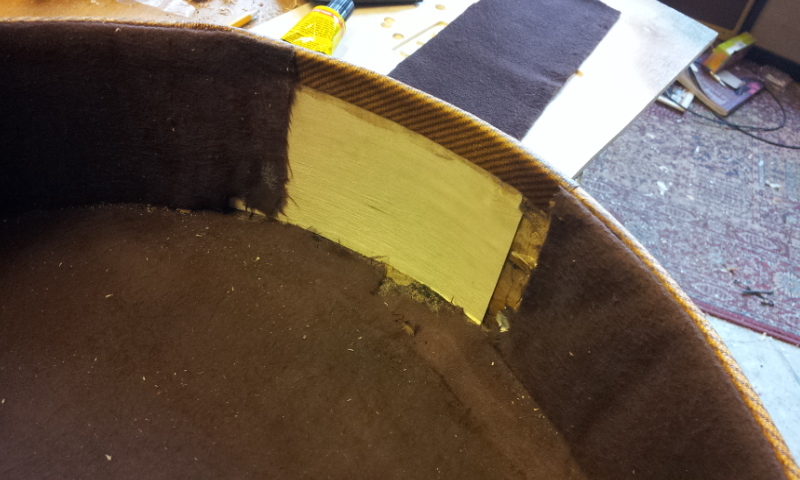 Only repair is the re-fastening of the original hinges. 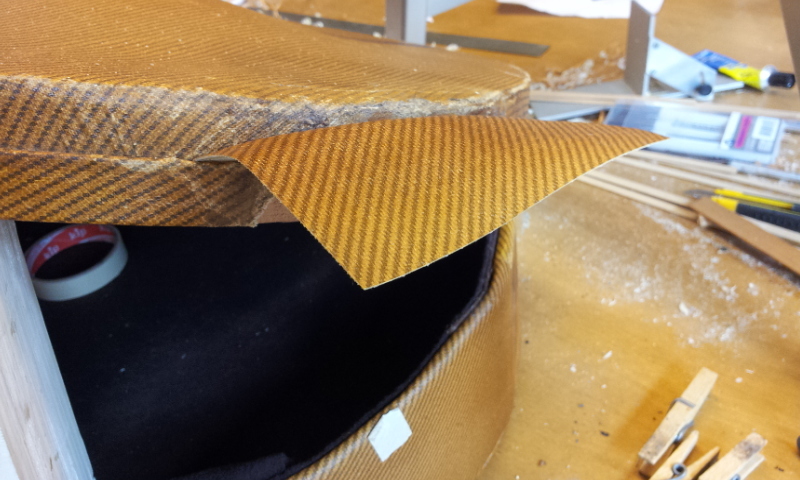 Leather handle is a replacement but looks cool. 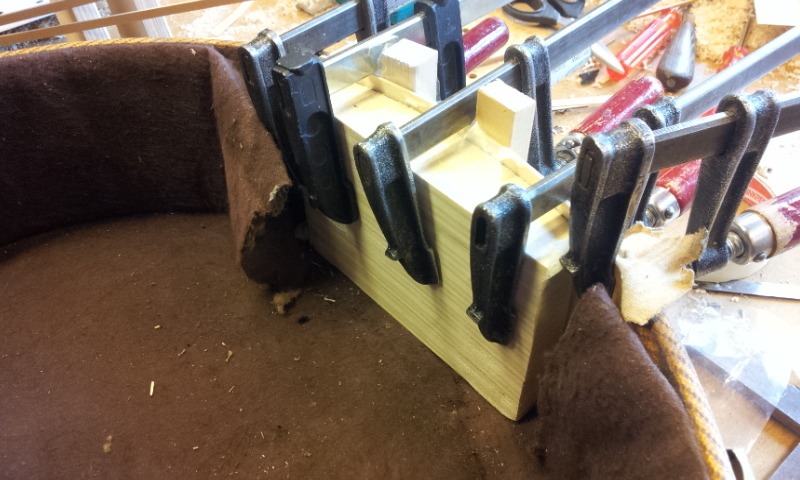 The metal feet are solid and in place. 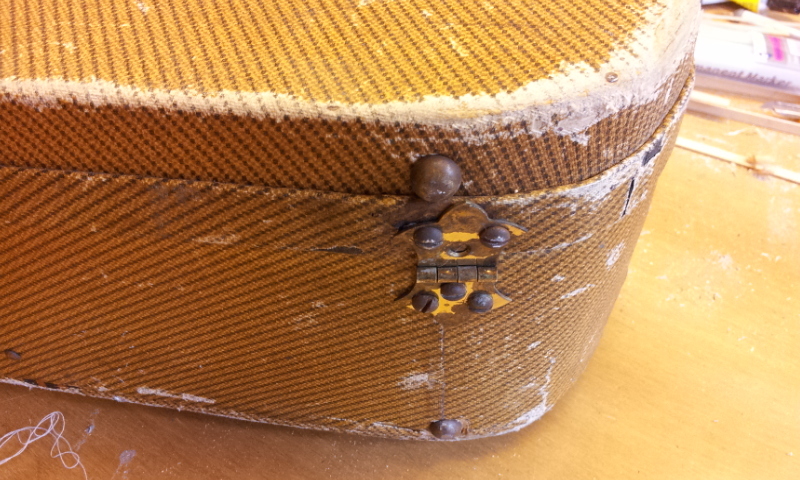 Amazingly clean case for it's age of about 80 years. 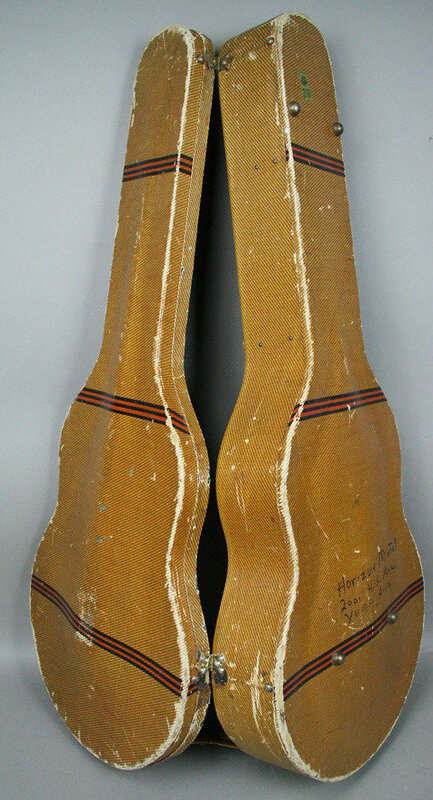 There is a name and address written on the back of the case. 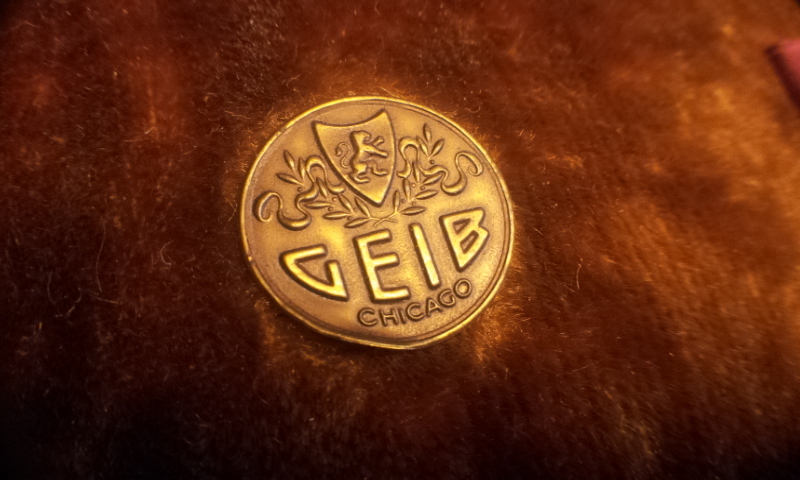 Geib stamp on the back of the case. 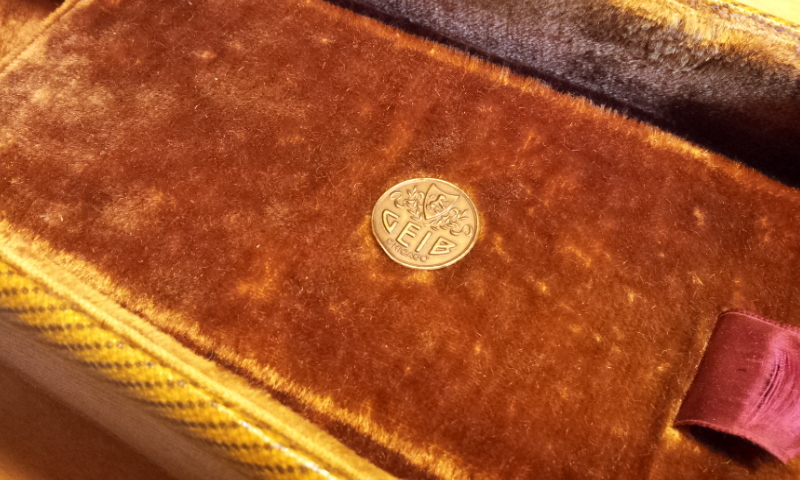 A rare find in this condition. 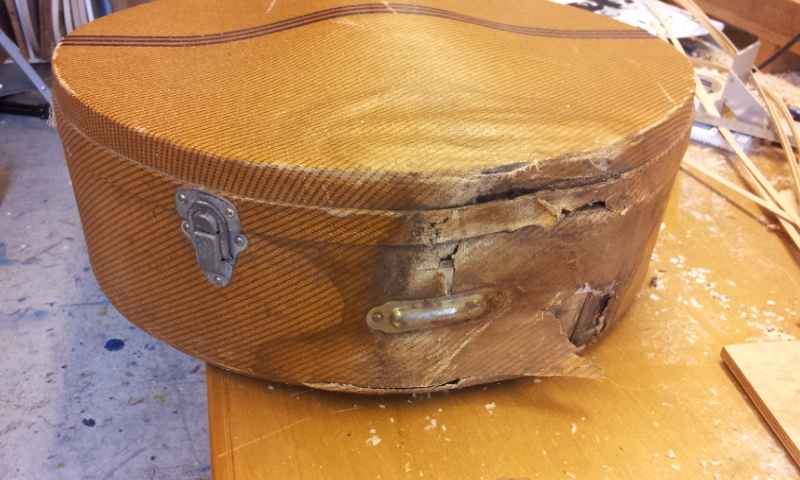 Case 2; for 16 inch guitar. 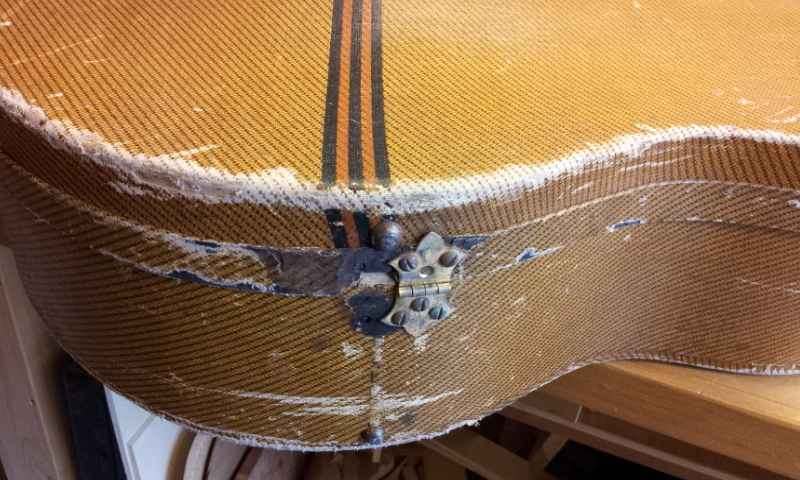 This case has some normal wear, but it seems like less wear than these old cases typically bear.The case suffered from water damage in the tail end area. 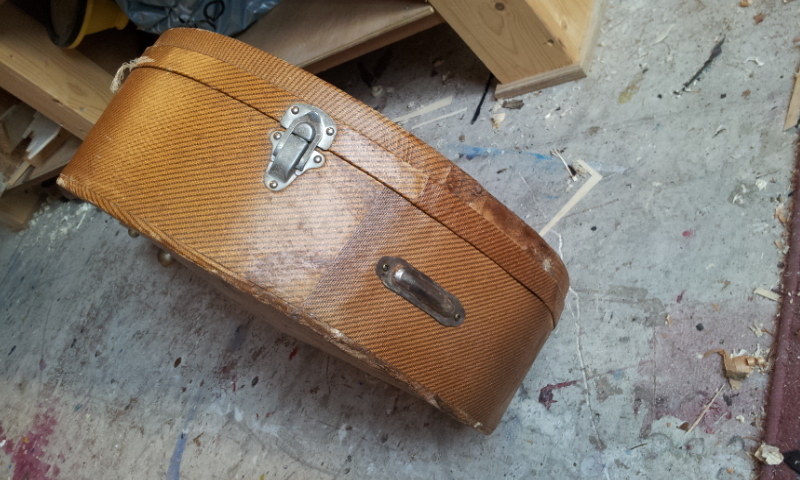 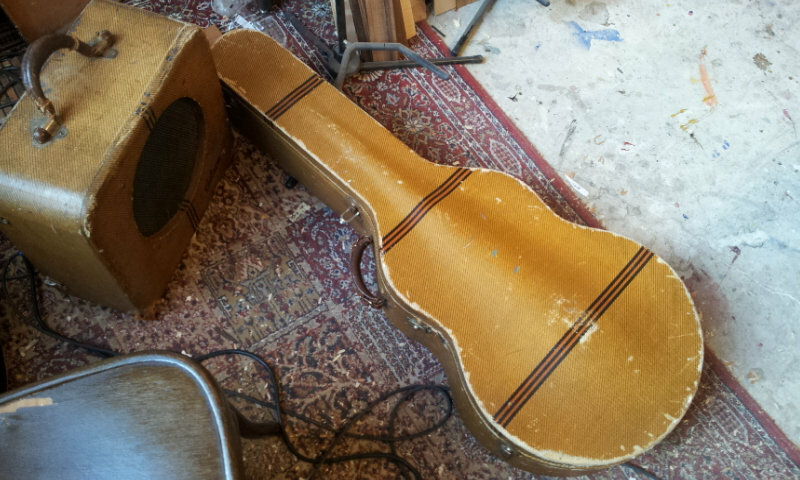 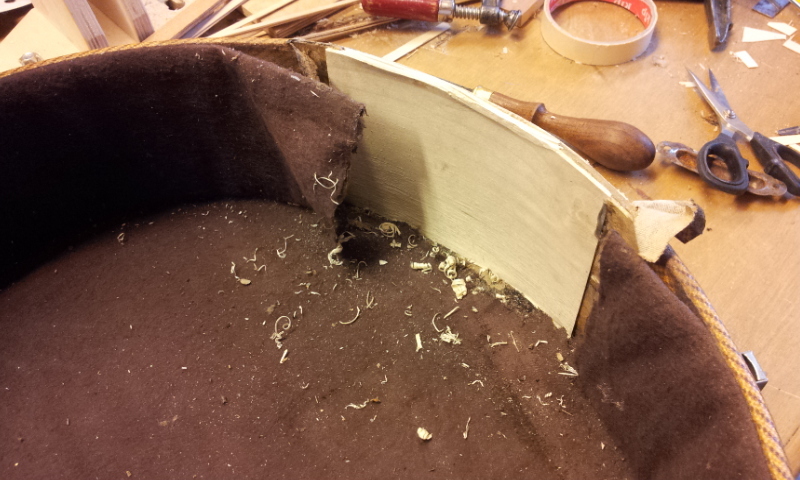 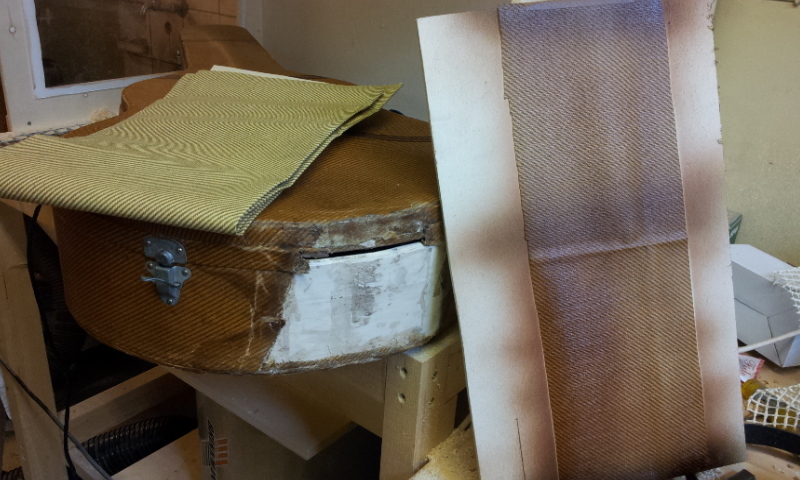 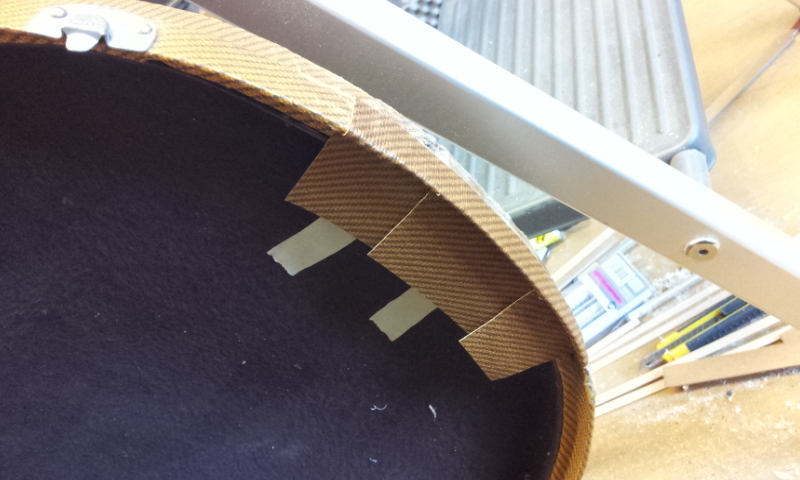 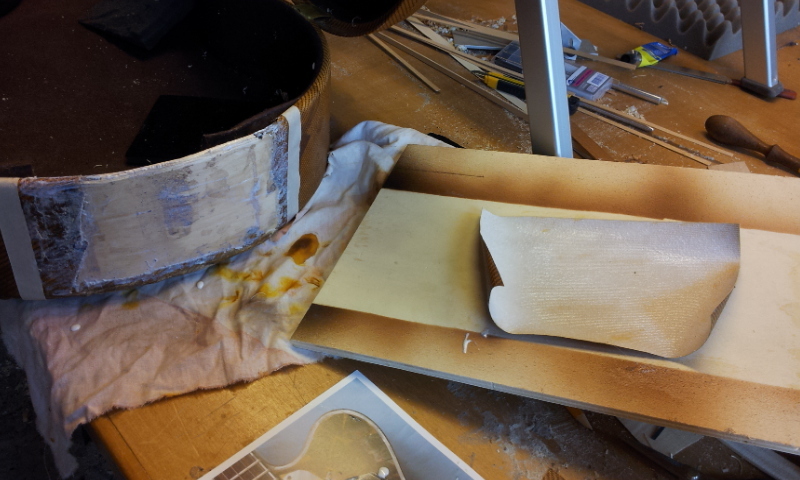 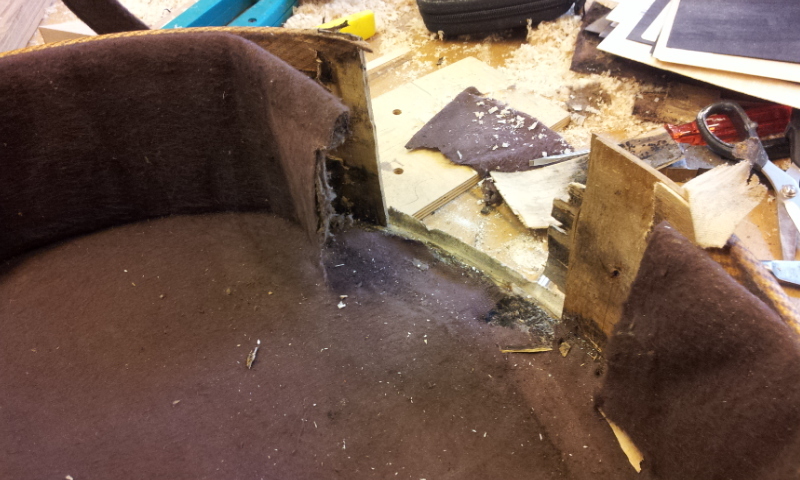 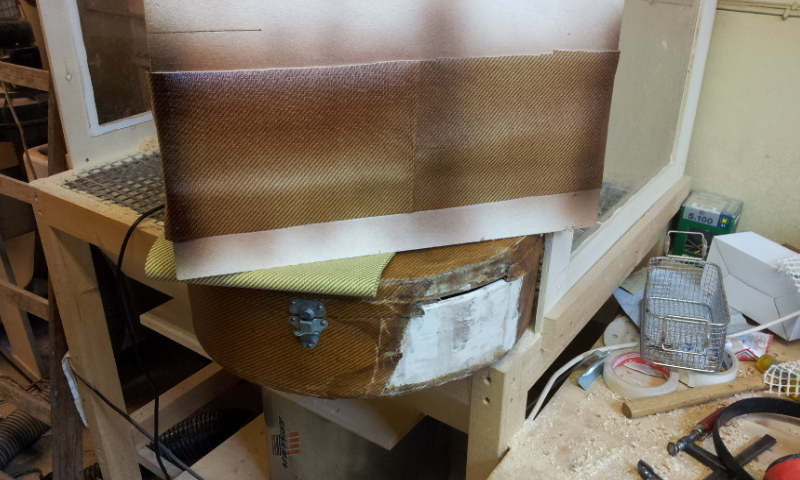 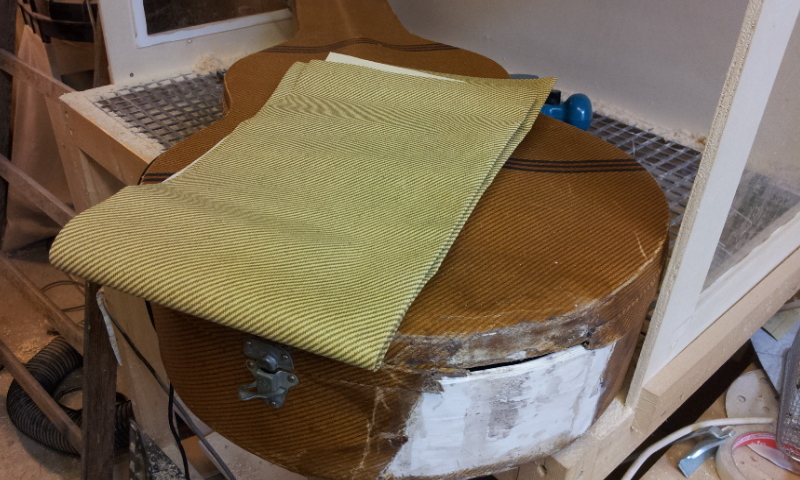 The water damaged area is rebuilt by Daniel (see pictures) and new Tweed tolex was coloured to get a good match. 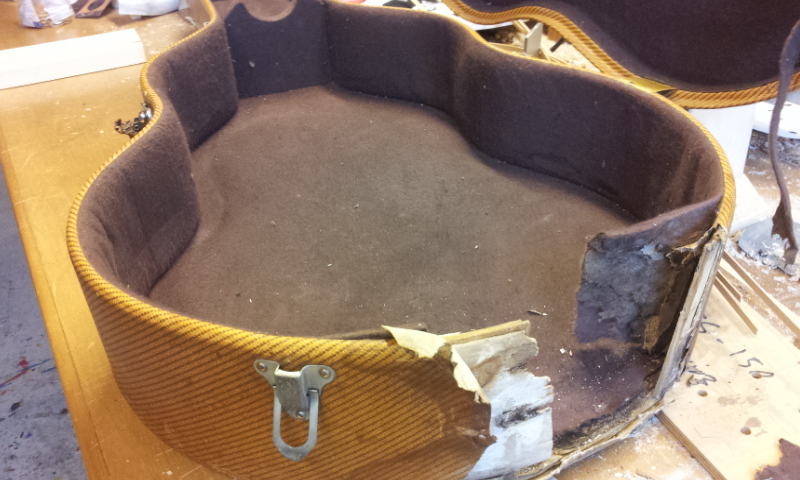 The old original DUVETINE (a soft napped flannel fabric) lining is there and upgraded with similar fabric in the water damage area. 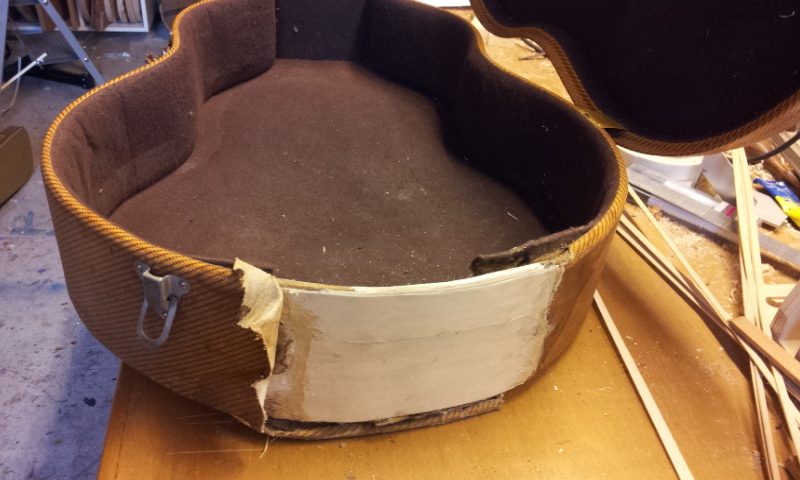 The storage compartment and neck brace are in very good shape and solid. 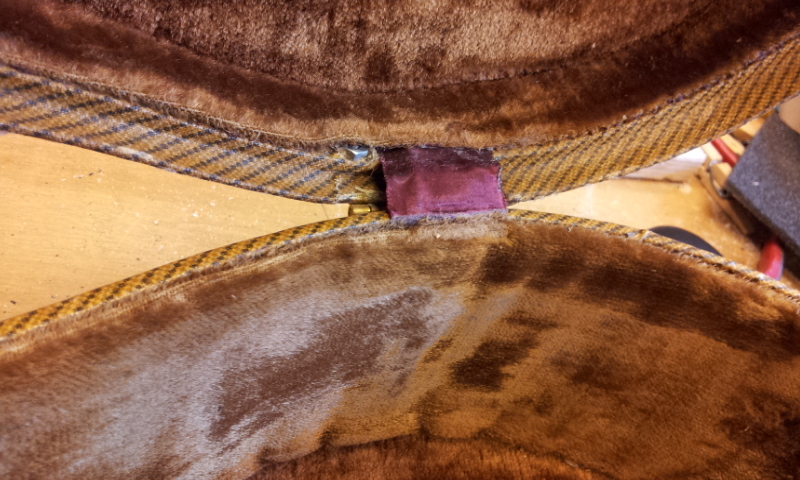 All three latches and both hinges are working fine. 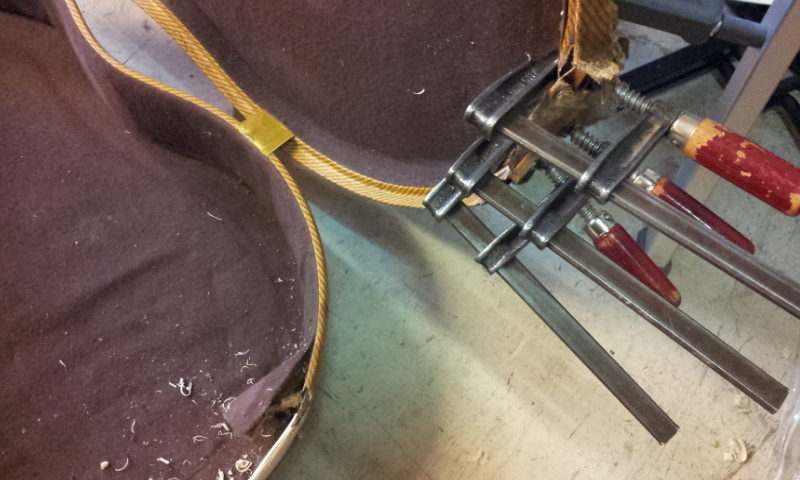 The metal feet are solid and in place. 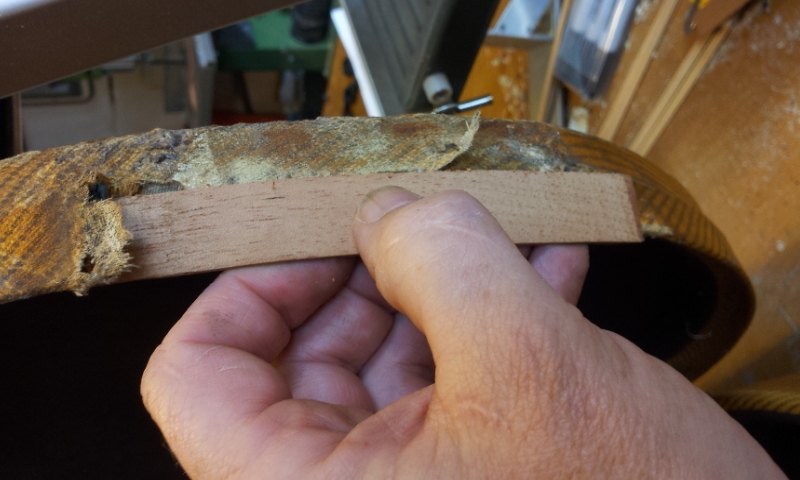 The lock latch works good. 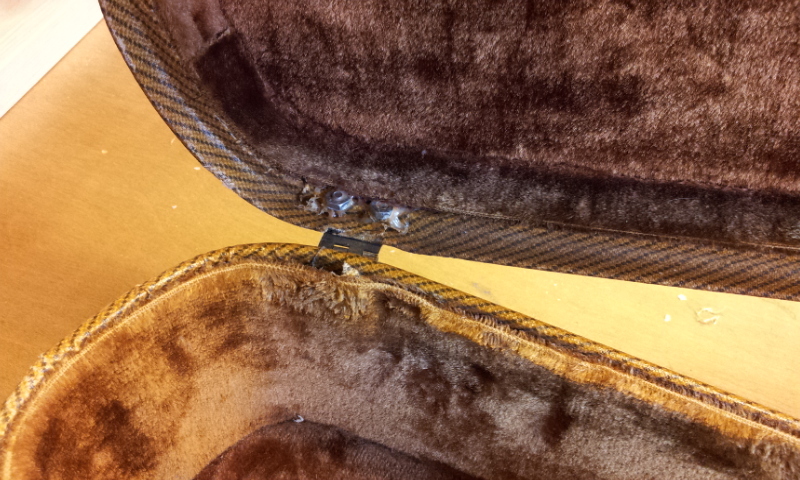 The leather on the handle is coming apart at the swivel connection areas, but otherwise in great shape, fully functional handle. 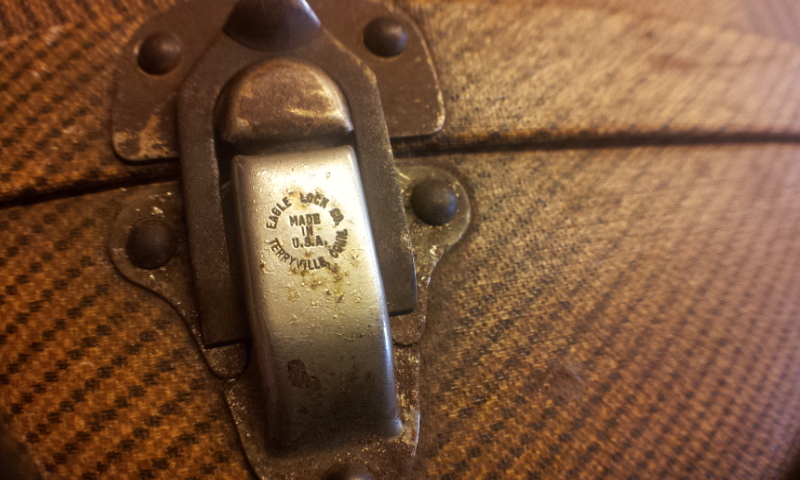 Both handle mounts are stamped "GEIB" on both sides. 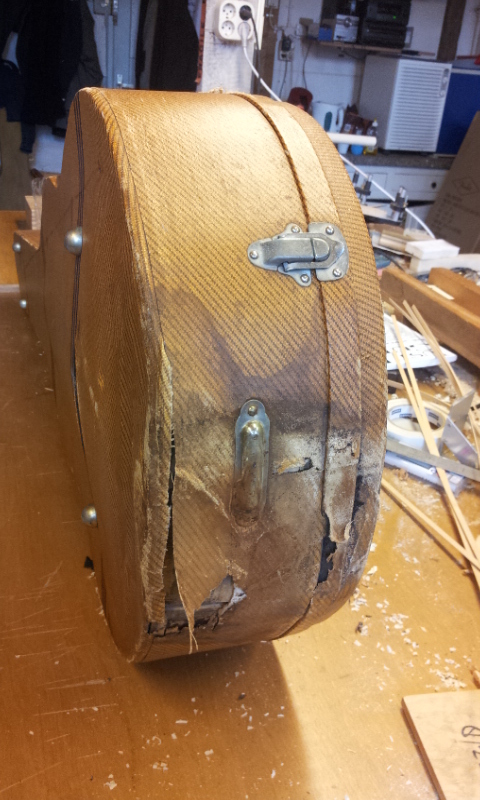 After Daniel's restoration this is a spectacular, historic, and functional object of character and beauty. 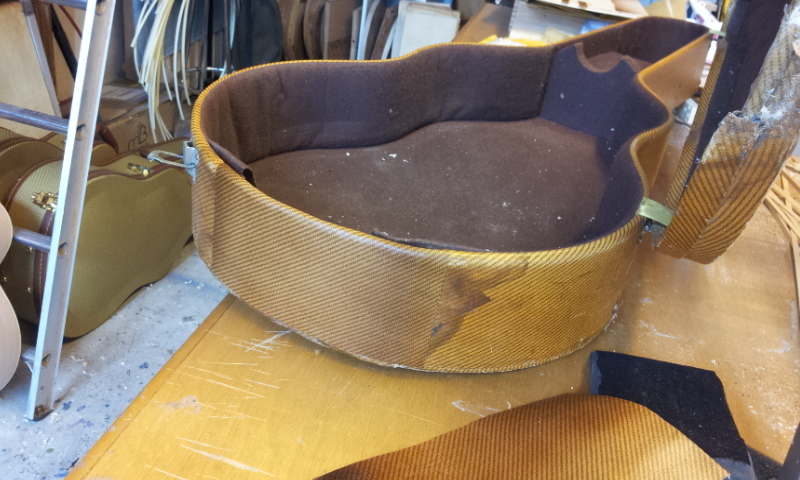 A perfect fit for a 16 inch jazz guitar.